When celebrity chef Edward Lee said, “Dessert is like a feel-good song and the best ones make you dance,” truer words have never been spoken. Here at Everyday, we love our desserts, and we adore them even more, when they’re made with a generous splash of guilt-free, fresh, healthy, Australian Extra Virgin Olive Oil (AEVOO). Used as a dairy substitute for butter or a healthier option to other cooking oils, AEVOO can produce the most lusciously soft, fluffy treats, not only enhancing the flavour of the ingredients used but also improving the overall texture of sweet dishes. This Pistachio, Cardamom and Olive Oil cake served with a dollop of cream and icing sugar is just the delicacy that the doctor ordered. 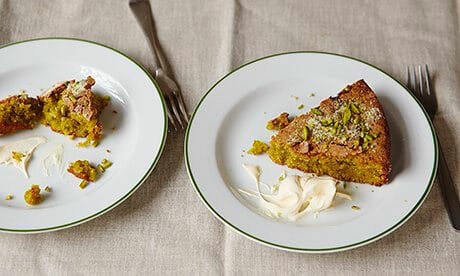 The star of this dessert has to be the toasted pistachios which give the dish its rich flavour, distinct green colour and a sweet nutty aroma you’ll want to bottle. This recipe actually mixes butter with AEVOO, which when combined with the egg and sugar creates a deliciously soft, fluffy and moist cake that will keep in the fridge for days. Life gave us lemons so we could bake these delightfully zesty cakes. This recipe is packed with the citrus goodness of three lemons, with the batter made from the juice and zest of two lemons, and the frosting using the zest of yet another lemon. As a healthier alternative to butter, this recipe uses AEVOO, which makes this zesty delight an extra light and even tastier. Honey, mango and chilli, oh my! This griddled spiced mango with honey, lime and chilli beautifully blends sweet and spicy flavours to perfection. It’s also really easy to prepare. Just preheat the grill to the highest setting, and place the mango on a small non-stick baking tray before covering in AEVOO and sprinkling with chilli flakes and a dash of honey and lime juice. Place the mango under the hot grill until golden-brown then serve with lime wedges and a generous dusting of icing sugar. This deliciously healthy dessert combines the freshness of chargrilled peaches with honey, yoghurt and sugar-glazed pine nuts for a simple and tasty weeknight treat. The sweetness of peaches and honey combines beautifully with the tanginess of yogurt, while the freshness of mint is divine addition! Using AVEOO to grill the peaches enhances its flavour, just cut the peaches in half and fry them in AVEOO on a hot grill-pan for around six minutes, or until the peaches have grill marks along the bottom. This wondrous delicacy from the magical land of Tuscany is a must-have for all dessert lovers. The Castagnaccio is a gluten-free dish prepared using chestnut flour, pine nuts, walnuts, raisins and rosemary. Legend has it that a long time ago, it was prepared using just water, chestnut flour and oil, but as its popularity grew, so did the number of ingredients! It’s now one of Tuscany’s favourite desserts and can be eaten both warm, and cool, it’s also perfect when accompanied by a chilled Chardonnay. Don’t forget to grease the baking dish with AEVOO for the dessert to come out smoothly with a little extra crunch and flavour.